The Optimist Center is made possible with the support and love of many people. This page is for our partners, suppliers, supporters and friends. The Town of Woodstock and the Woodstock Economic Development Commission provided grant funding to the Optimist Center to support our first year of operation and build out costs. We couldn't have started without them and we are incredibly grateful for their support and encouragement. Woodstock, Vermont is a town we feel lucky to call home and our Optimist Center is located right downtown at 67 Central Street. We are proud to be the first and only coworking space and retreat studio located in downtown Woodstock. Our main street is also home to Soulfully Good Cafe, Mon Vert Cafe, Woodstock Pharmacy, Unicorn Gifts, Yankee Bookshop, 37 Central, Elevation Clothing, Gillingham's and Woodstock Inn. There's no end to the beautiful shops you can visit and we recommend starting at the Visitor's Center located right behind the pharmacy when you come in to town! 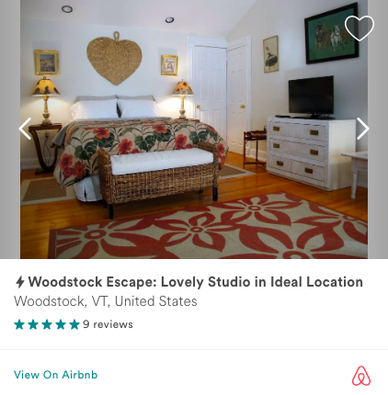 We are Vermont's first coworking space to offer an Airbnb studio available for guests to stay overnight. It's the perfect place for you to stay if you want to attend a workshop, have a weekend retreat for your business, or simply have a relaxing visit. Each stay comes with free access to the Optimist Center, gift certificates to our local cafes in the morning so you can enjoy breakfast, and easy access to all the wonderful things Woodstock and Vermont have to offer. ​We'd love to have you visit!